It’s officially the first day of Fall and I’m thrilled to break out my cast iron skillet and dutch oven to start experimenting with new seasonal recipes. 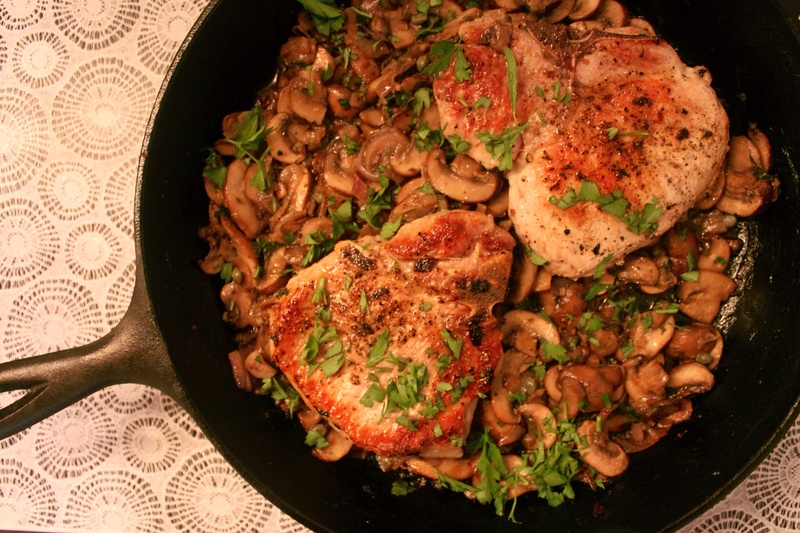 Earlier this week I made a quick supper with mushrooms, capers and shallots caramelized in a cast iron skillet with a sauce of white wine and Dijon mustard. Add some browned bone-in pork chops and it’s a full meal. I added some fresh blanched green beans for color and a healthy vegetable. It’s time to break out your college sweat shirts, enjoy some quality night time television and heat up the kitchen with cosy recipes. I’ve got my eye out to keep you cooking new recipes this season. In a large frying pan heat the butter over medium heat. Season pork with salt and pepper. Brown the chops until golden brown on both sides – don’t rush this, it’s important. Remove the chops and put in a warm spot. Add shallots to the pan and cook, stirring, until soft, about 3 minutes. Add mushrooms and shallots. Saute until browned and tender. Add capers, mustard and white wine. Add pork chops back to the pan. Add the entire pan to the oven until the chops are cooked through and mushrooms are caramelized. Absolutely awesome! Just made this for dinner and this is a keeper.